There’s still two days until The Dark Knight Rises arrives in theaters and already everybody’s got an opinion on it. (Not to mention an opinion about those opinions.) Also contributing to the shouting match, as he so often does, is conservative talking head Rush Limbaugh, who said during his syndicated radio show on Tuesday that Christopher Nolan’s hotly anticipated film isn’t the final installment of his Batman trilogy, but left-wing propaganda aimed at making “brain-dead people…the pop culture crowd” (hey, that’s us! Shout-out!) not vote for Mitt Romney. Limbaugh, who says an awful lot of things, told his listeners that he thinks it’s no coincidence that a movie in which the menacing villain is named Bane (Tom Hardy) is coming out at the same time questions about circulating about Romney’s time at the investment fund Bain Capital. Coincidentally, the character of Bane has been around for nearly 20 years and the choice to use him as the baddie for The Dark Knight Rises was made in early 2011. “Do you think it is accidental that the name of the really vicious, fire-breathing, four-eyed, whatever-it-is villain in this movie is named Bane?” Limbaugh — who took some artistic liberties by adding two additional eyes and a fire-breathing skill for Bane — asked his listeners on Tuesday. “So this evil villain in the new Batman movie is named Bane,” Limbaugh said of the film, which has previously drawn comparisons to the Occupy Wall Street movement, “And there’s discussion out there as to whether or not this was purposeful and whether or not it will influence voters. It’s going to have a lot of people. The audience is going to be huge. A lot of people are going to see the movie. And it’s a lot of brain-dead people — entertainment, the pop culture crowd — and they’re going to hear Bane in the movie and they’re going to associate Bain.” Or, Rush Limbaugh just made the association for them. “The thought is that when they’re going to start paying attention to the campaign later in the year,” Limbaugh continued, “and Obama and the Democrats keep talking about Bain, not Bain Capital but Romney and Bain, that these people will start thinking back to the Batman movies, ‘Oh yeah, I know who that is! '” You know, how people are always confusing Tom Hardy and Mitt Romney and unable to decipher fiction from reality. Kid-friendly fare like Wall-E often at the forefront of liberal brainwashing theories. In 2006, then-Fox News pundit Glenn Beck cried that the dancing penguins feature Happy Feet was “animated version of An Inconvenient Truth.” Six years later his Fox News cohort Lou Dobbs warned that The Lorax and The Secret World of Arrietty were trying to “indoctrinate our children” with their messages about “sharing” and “anti-industrialism.” And don’t even get them started on those pinko commies The Muppets. But no film may have felt the scorn from the right quite like James Cameron’s Avatar did. In 2010 Slate discovered that the movie was called everything from “a big, dull, America-hating, PC revenge fantasy,” “abhorrent New Age, pagan, anti-capitalist worldview that promotes Goddess worship and the destruction of the human race,” and, of course, “cinema for the Hate America crowd.” Somewhere, a VHS copy of Ferngully is tremendously relieved it came out in 1992. 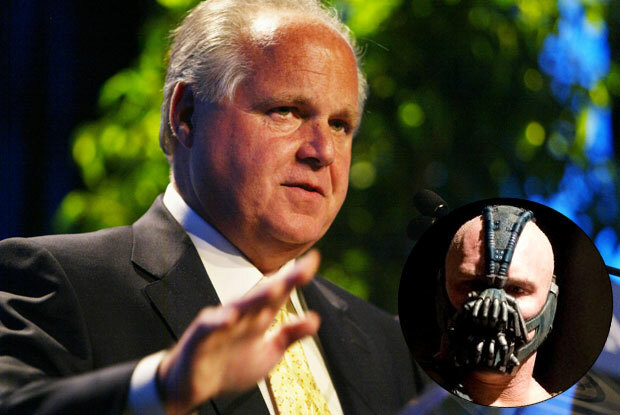 What do you think of Rush Limbaugh’s stance on The Dark Knight Rises? Do movies really have an “agenda”? Sound off in the comments section.